Michael Singer Studio was engaged by members of the local community and subsequently contracted by the City of Lake Worth to conduct a Site Visioning Study for the Lake Worth Municipal Beach. The project involved researching current conditions at the site, review of the many past planning studies, as well as an open community dialogue including numerous workshops and a three-week online survey. The Studio’s fast-paced Site Vision process created a design and planning consensus that was overwhelmingly approved by the community and its leaders. This consensus saved the municipality from losing a $5 million County Parks bond that was awarded many years prior and not utilized due to community disagreements about the project’s future. A key part of the Singer Studio findings was that the planned parking structure for the lower half of the site was unnecessary and that through proper planning and layout the required parking could be accommodated without a multi-million dollar structure. Funds for the parking structure were therefore able to be focused on recreational, aesthetic and ecological enhancements to the upper level of the beach. The Studio was subsequently hired as a part of a design team to develop the Site Vision into a full Schematic Design that was based on 30 discreet environmental principles and project elements. The innovative beach design replaces large expanses of asphalt at the top of this rare and extraordinary public oceanfront with active and passive recreational areas and a regenerated landscape. 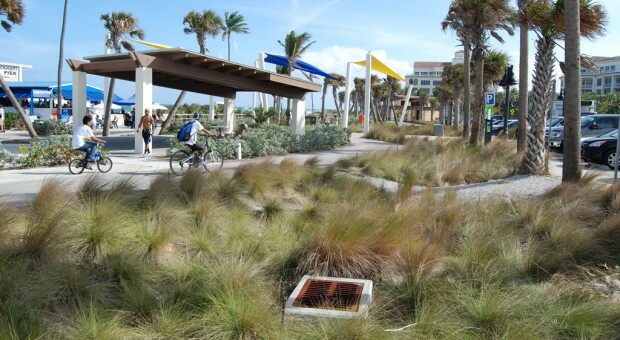 Pedestrian and bicycle paths, native coastal vegetation, shaded overlooks and sea-turtle friendly lighting were designed along the eastern oceanfront promenade. The recreational landscape incorporates open-air pavilions and elements that harvest water (storing it in cisterns for re-use in the irrigation systems), generate energy for the park (wind turbines and solar generating shade structures), and offer space for special programs and public events. Bioswales and recycled permeable paving are designed to filter and infiltrate stormwater back into the ground throughout the project site. Highlighting the social and natural history of the site is a major feature of the park. The back slope of the site is enhanced as a native coastal hammock with a fully accessible pathway that interprets the ecological and archeological history of the area. The project was completed with most of the project design implemented; some additional shade elements, environmental features (solar, wind turbines, rainwater cisterns), historical pavers and signage and additional site amenities (such as more benches, as originally planned) may be implemented in a future phase. and Jonathan Haigh at Kimley-Horn Associates Inc.
continually supported this project and its ecological regeneration over the course of many years.